Grangetto's Farm and Garden Supply Services - » Fun with the Kids! Trying to think of things to keep your kids busy over the summer? Summer (or just about any season in Southern California) is a great time to “sow” the love of gardening in them by engaging them in some fun summer projects. Help your child construct a house or teepee by using stakes and twine. To build the house, place 4 (6′-8′) stakes about 6′-8′ apart making a square; be sure they are sturdily set in the ground so that they won’t collapse when the future “walls” and “roof” are covering them. On one side of the square, create your doorway by placing 2 stakes about 2′ apart in the center. Secure the stakes with twine near the bottom, in the center and near the top by starting at one side of the doorway and going all the way around the “house” to the other side of the doorway, wrapping the twine several times around each stake as you go. Prepare a planting bed all around the “foundation” of the house, incorporating a good quality planting mix into the soil. Plant sunflower seeds and/or a fast growing–non-poisonous or even edible–vine. These will grow up around the walls, making your living house. If you string some twine across the top of the structure, your vine will grow along the twine, forming a roof. A teepee can be constructed using 5 (6′-8′) poles that are tied together near one end, forming the teepee shape. Near the bottom of each pole, plant pole beans, preparing the soil as above. These will grow up and cover the teepee. These structures make great shady “get-away” areas for your kids to go to have a little private time to commune with nature! 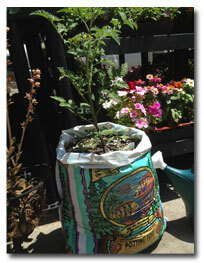 Many potting soils and some soil amendments can be used to plant right in the bag. This is a fun, easy and inexpensive project to instill the love of growing and harvesting home grown produce. 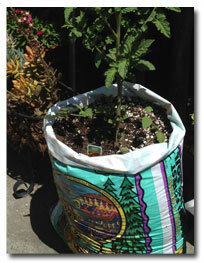 Simply purchase a bag of soil Fox Farm® Ocean Forest Potting Soil is a excellent choice), cut off the top of the bag and position it where it will get at least 6 hours of sun a day. Punch a few small holes in the bottom of the bag to provide drainage. Let your child choose the vegetable of his or her choice. When you get home, plant right in the bag. 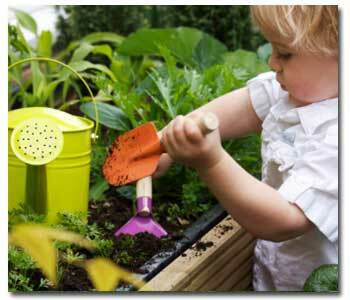 Your child can be responsible for the plant by checking it daily to be sure it is getting the right amount of water. You can also teach him or her about feeding the plant when needed and explain how every living thing (including plants) needs nutrients. When it’s time for the harvest, you can cook a meal with your child using the vegetables he or she grew. This one easy project will provide many opportunities to share the love of gardening! When your flowering plants go to seed, show your child how to collect the seeds and explain how these seeds can be planted in the garden for next year’s flowers. You can turn it into an art project, too, by helping your child make their own seed packages; allow them to decorate each pack with the names and pictures of each plant. Next year, when its time to plant, you can use the seeds that they collected! These easy and fun projects also have the added benefits of getting your child away from the television set, getting them out in the fresh air and sunshine and giving them some much-needed exercise!